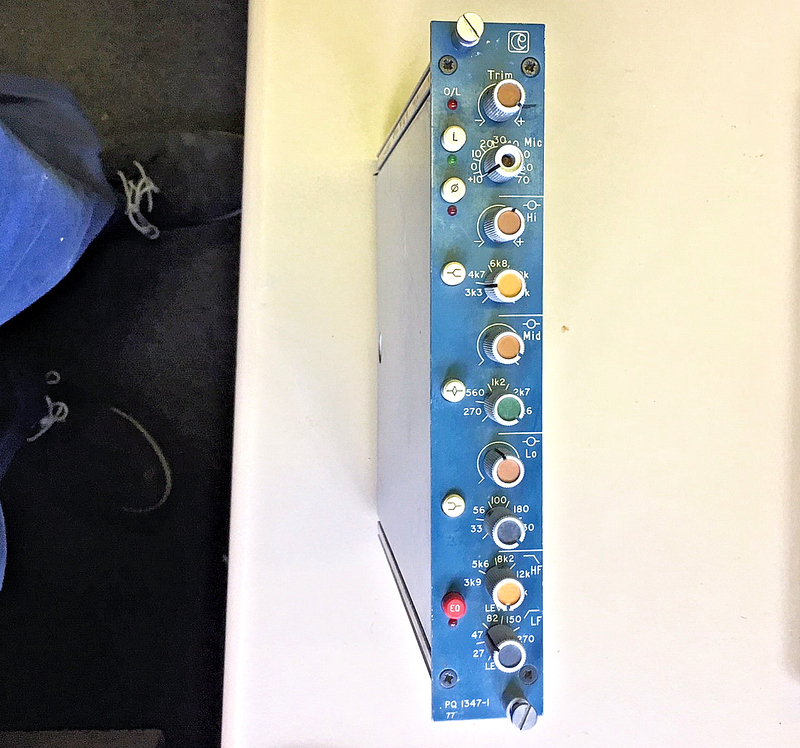 4 Mic Pre-Amp EQ modules with transformer output boards £1,600 per 4 modules. Modules from a Calrec M Series console. The PQ 1347 module has Lundahl transformer balanced input and provides a Microphone Pre-Amp with a 3 band parametric equaliser plus frequency variable High Pass and Low Pass filters. Each lot of 4 PQ 1347 modules come with a 4 way Lundahl transformer output board. Level Trim pot : Mic / Line switch : Mic Gain 80 db range : Phase reverse : High Frequency Shelving / Peak & Trough switch : High Frequency Boost & cut pot : High Frequency range pot 3k3 Hz to 15 kHz : Mid Range switchable Q : Mid Frequency Boost & cut pot : Mid Frequency range pot 270 Hz to 5k6 Hz : Low Frequency Shelving / Peak & Trough switch : Low Frequency Boost & cut pot : Low Frequency range pot 33 Hz to 330 Hz : High Frequency Roll Off Filter pot 3k9 Hz to 18 kHz : Low Frequency Roll Off Filter pot 27 Hz to 270 Hz. EQ In/Out switch.